'Awesome,' Rep. Giffords Says After Getting OK To Be At Shuttle Launch : The Two-Way "Medically, there is no reason she could not travel safely to Florida to participate in this incredible event with her husband," the director of the neuroscience institute at Houston's TIRR Memorial Hermann Hospital confirmed today. Saying that "medically, there is no reason she could not travel safely to Florida to participate in this incredible event with her husband," the director of the neuroscience institute at Houston's TIRR Memorial Hermann Hospital confirmed today that Rep. Gabrielle Giffords (D-AZ) has been given the OK by her doctors to be at Friday's scheduled last launch of the space shuttle Endeavour. 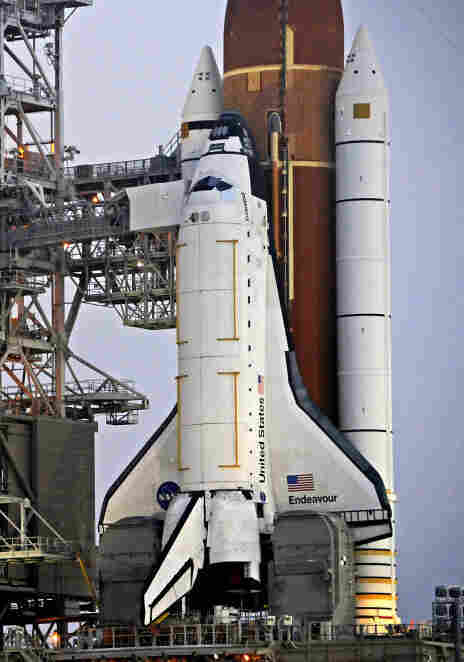 The space shuttle Endeavour, on the launch pad at the Kennedy Space Center in Florida. "She is medically able and well enough to travel without additional risks," Dr. Dong Kim added, according to The Arizona Republic. The widely expected and welcome news was pre-announced by Giffords' husband, Endeavour commander Mark Kelly. He told CBS News anchor Katie Couric, in an interview broadcast today on The Early Show (and more will be the CBS Evening News later today) that the congresswoman said "awesome" and pumped her fist when the doctors told her of their decision. Giffords was critically injured on Jan. 8 when a gunman attacked an event she was holding outside a Tucson strip mall. Six people were killed and 13, including Giffords, were wounded. "Almost every 72 hours, she resembles more closely the woman she was before." As our friend Frank says over at It's All Politics, Giffords' attendance at the shuttle launch will add "a powerful new dramatic element to ... [an] event that normally has a great deal of drama in its own right."